^did they play SES on the radios? and are they playing Rabiosa now ? btw my sis told me tomorrow she will get her tickets (i hope so ) and she said she may even take mum & dad !!!! ! That would be great! I hope they'll get Basim Christo for the job if it happens. Fadi, is the arena far from the airport? but make sure to get your ticket very soon before they sell out! some categories are already sold out! The official website for Shakira in Lebanon! News, info and everything you need to know about the biggest concert to ever be held in our country! @Fadi Any info about a possible broadcast? There is a "VIDEO" section on the site that says "COMING SOON", so that's a good sign! To Shakira Fans out there: Get the chance to dance ON STAGE WITH SHAKIRA on May 26 at SHAKIRA Live in Lebanon presented by Mix FM and Solicet!! Mix FM is giving you the chance to dance with Shakira just by sending your name, age and dance video link to shakiradancers@mixfm.com.lb! Edited by Fadi, 09 May 2011 - 04:56 AM. I asked my sister to check for me for DELL & SW in Lebanon and she said she couldn't find Shakira , in 3 shops now pff Is it true Fadi? and do you have any idea where she may find them? but why did you ask her to get them for you? its getting sooner , right? how are you feeling ? 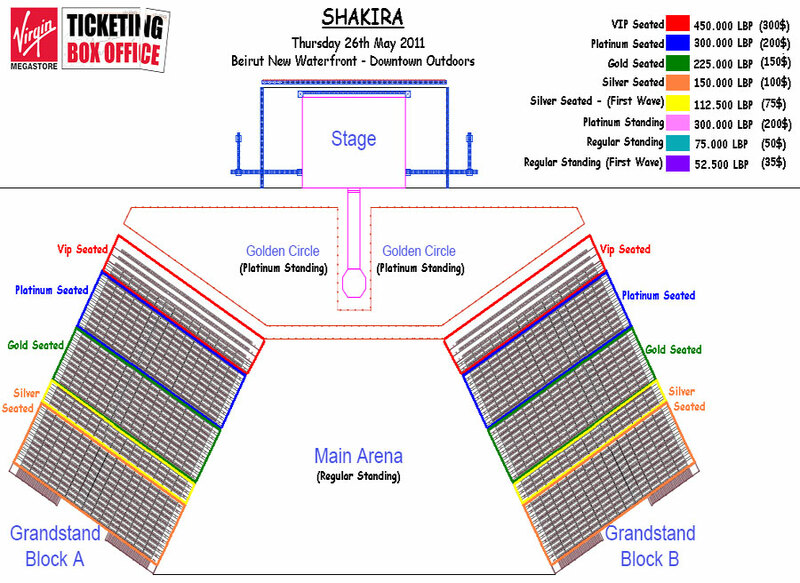 you got any preparations or plans that u'll do related to the concert? found a way to meet her and stuff? Wasn't Tiesto's concert attended by ~30K or something? It'll be hard for her to surpass that. Congratulations!!!!! I did it too, its SO AWESOME! Enjoy it cuz its over before you know it! Ooh im really happy for you!! Don't forget to tell someone to capture it on video. We wanna see you dying of joy, haha. As for Tiesto, what I was told is that there were around 24K on the beach and another 6K in the streets but yeah most people are speculating Shakira's will be the biggest non-trance/dance event in Lebanon's history. Congrats, Fadi! Tell her to perform Rabiosa in her ear! Edited by Boriqueno Prince, 17 May 2011 - 02:49 PM. Yes to the little details! All that sounds so awesome! And congratulations! Soooo excited for you!!! I think one of the best parts of this tour was the inclusion of fans in the show (dancing during Waka Waka and Whenever Wherever). It finally gave her real fans, especially a lot of people here on ShakiraMedia ... not me , the opportunity to do something special. disneyreporter: Eric, you're so sweet. You're always happy for everyone although you didnt get the chance to be with her on stage. You're such a nice person. I really hope you'll get close to her somehow! You're a big fan, you'd deserve it! Hichou : They started this "game" very late in Hungary. A week or less before the concert. Dont worry, you'll hear about it soon! Have fun!!! You're representing us up there, so dance well!